Nuclear weapons are the most destructive, inhumane and indiscriminate weapons known to humankind, and there are still about 14,500 of them. Over 95% of these are in the United States of America (USA) and Russia, each of which keeps about 1,500 on ‘hair trigger alert’, meaning that they can be launched within 30 minutes. Seven other States have nuclear weapons: China, France, the United Kingdom (UK), India, Pakistan, Israel and North Korea. All of them are modernising and upgrading their arsenals. Two key factors set nuclear weapons apart from conventional weapons: first, the sheer destructive power of nuclear weapons, from a massive fireball of heat and blast; and secondly, the radioactive plutonium or uranium 235 fissile material is extremely toxic and poisons the environment. This radioactivity can last for thousands of years, depending on various other factors such as wind direction and the proximity of explosion to the ground. Health professionals, relief agencies and governments now admit that there is no adequate response to even one nuclear weapon detonation. Targeted cities would be incinerated amid a widespread radiated wasteland and health catastrophe. The long-term radiation effects of nuclear weapons are also devastating: survivors experience many health problems including cancers, birth defects and miscarriages. Radiation changes the DNA of all living creatures, and the effects are inter-generational. Climate scientists have modelled the impacts of a ‘small’ nuclear war, an often cited example being between India and Pakistan using just 100 nuclear weapons. The effect of even a small war such as this would be rapid climate cooling, followed by a nuclear winter and widespread global famine. Read more on this topic by Alan Robock, Department of Environmental Sciences, Rutger’s University, here. Nuclear weapons have only been used twice in warfare, on Hiroshima and Nagasaki at the end of World War Two, on 6 and 9 August 1945. At Hiroshima, over 130,000 civilians were killed almost immediately, and thousands more either died shortly afterwards or suffered from a number of different illnesses as a result of the radiation. Read more about the bombings of Hiroshima and Nagasaki and the continuing impacts here. Many areas of the globe have been affected by nuclear testing by the nuclear weapon states. Some of these tests took place in remote areas of their own lands, many others took place in the homelands of other people. The former Soviet Union tested nuclear weapons in areas under their control, such as Kazakhstan, Uzbekistan and Ukraine. The USA tested nuclear weapons mostly in the Nevada desert, but other tests took place in places such as Alaska, Mississippi and New Mexico. Since 1945, over 2,000 nuclear weapons have been tested in the Pacific (Marshall Islands, French Polynesia, Kiribati), USA, Australia, Algeria, Kazakhstan, China, and North Korea among other places. The peoples whose homelands have had test sites have been affected as their lands and seas have been damaged and contaminated, by the USA, former Soviet Union, UK, and France. Read more about the humanitarian and environmental impacts of nuclear testing on the peoples of the Pacific here and here. Read more about how nuclear testing affected New Zealanders in this report from Pace University’s Disarmament Institute and the protests against it here. Watch this series of free online interactive documentaries called Nuclear Dissent on nuclear testing in the Pacific. 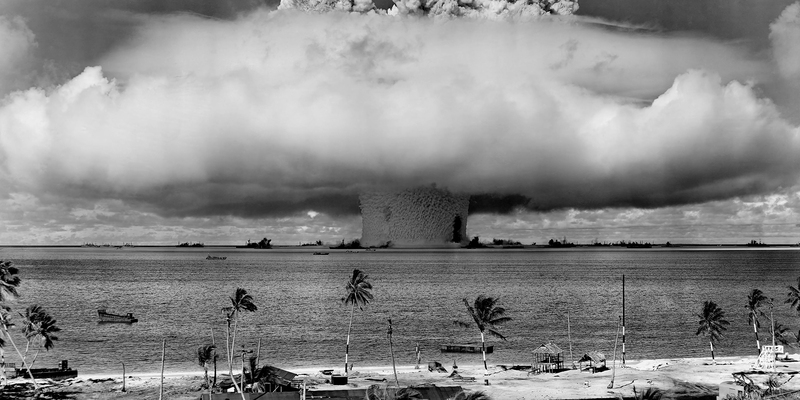 Disarmament & Security Centre publications on nuclear testing can be found here. Currently, it is estimated that the nine nuclear weapon States spend over US$105 billion annually on the nuclear weapon industry, that is over US$12 million per hour. According to ICAN, the World Bank forecast in 2002 that an annual investment of just US$40–60 billion, or roughly half the amount currently spent on nuclear weapons, would be enough to meet the internationally agreed Millennium Development Goals on poverty alleviation by the target date of 2015. Read more about nuclear weapons spending here. Read about divestment from the nuclear industry in the Don’t Bank on the Bomb Report here and Move the Nuclear Weapons Money here. 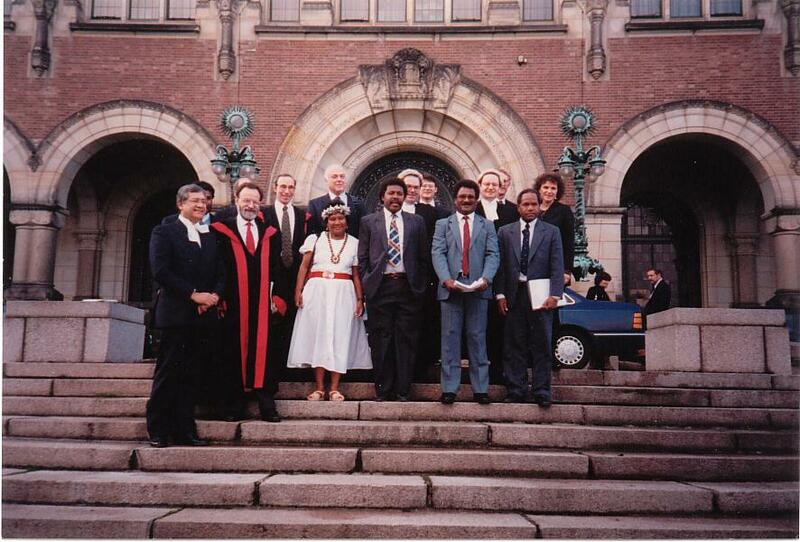 Keith Mothersson and Japanese NGOs with DPCs at the ICJ July 1996 . 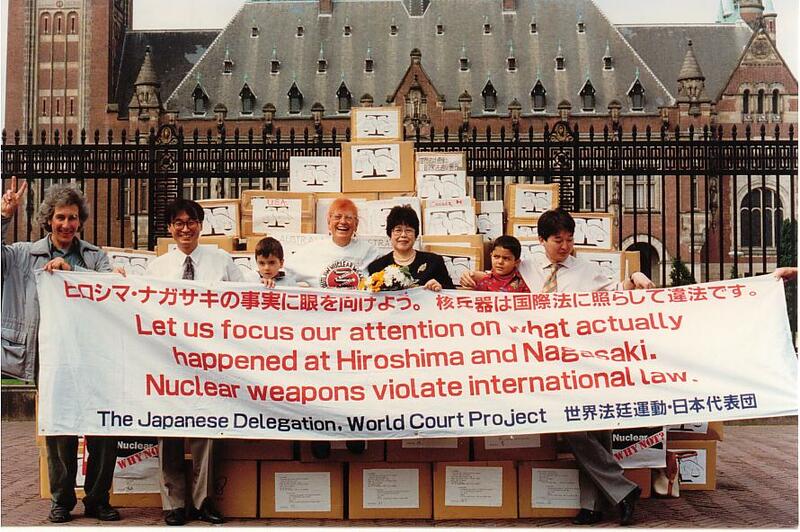 The first international citizen campaign to challenge the legality of nuclear weapons was launched in 1992. In 1994 the World Court Project (WCP) helped persuade the UN General Assembly to adopt a resolution requesting an Advisory Opinion from the International Court of Justice (ICJ) on the question: ‘Is the threat or use of nuclear weapons in any circumstance permitted under international law?’ Over forty states, including the US, UK, France and Russia, gave evidence - more than twice the participation in any previous World Court case. The Court accepted nearly 4 million individual Declarations of Public Conscience for the first time as ‘citizens’ evidence’. Read more about the WCP here. The Court’s 34-page Advisory Opinion was given on 8 July 1996. It agreed unanimously that ‘There is in neither customary nor conventional international law any specific authorization of the threat or use of nuclear weapons’ and that ‘A threat or use of force by means of nuclear weapons that is contrary to Article 2, paragraph 4, of the United Nations Charter and that fails to meet all the requirements of Article 51, is unlawful’. It also found that ‘the threat or use of nuclear weapons would generally be contrary to the rules of international law applicable in armed conflict, and in particular the principles and rules of humanitarian law’, and that ‘There exists an obligation to pursue in good faith and bring to a conclusion negotiations leading to nuclear disarmament in all its aspects under strict and effective international control’. Since 1996, the majority of states have used this Advisory Opinion to call for a comprehensive, universal, binding legal instrument similar to the Chemical and Biological Weapons Conventions through annual UN General Assembly resolutions. ICAN campaigners from across the globe gather at the United Nations of the negotiations on the treaty on the Prohibition of Nuclear Weapons. Building upon the World Court Opinion, the Treaty on the Prohibition of Nuclear Weapons (TPNW) was adopted on 7 July 2017, and opened for signature on 26 September 2017. Access the Treaty text here. Activities such as nuclear weapon use, threat, possession, testing and development are now prohibited in all signatory states. Around 140 UN member states participated in the negotiations in the United Nations General Assembly, and the TPNW was adopted by 122 States.. See the negotiating conference website here for further details. As of October 2018, 69 States have signed the TPNW and 19 have ratified it. The Treaty will enter into force 90 days after the 50th ratification. See the status of the treaty here. The Non Proliferation Treaty (NPT) is an international treaty whose objective is to prevent the spread of nuclear weapons and weapons technology, to promote cooperation in the peaceful uses of nuclear energy and to further the goal of achieving nuclear disarmament and general and complete disarmament. See the Treaty text here. The NPT opened for signature in 1968, the Treaty entered into force in 1970. On 11 May 1995, the Treaty was extended indefinitely. A total of 191 States have joined the Treaty, including the five recognised nuclear weapon States. More countries have ratified the NPT than any other arms limitation and disarmament agreement. See the status of the Treaty here. The NPT acknowledges possession of nuclear weapons by the USA, Russia, China, France and UK – the five permanent members of the UN Security Council (or P5) – while the non-nuclear signatory States agree not to acquire them. In addition, all signatory States agree to work towards complete nuclear (and general) disarmament, and allow access to peaceful nuclear technology for energy purposes. However, 50 years since the treaty was adopted, the P5 are modernising and upgrading their arsenals. Four other States (India, Israel, Pakistan and North Korea) now also possess nuclear weapons outside the NPT framework. There is increasing tension between the nuclear and non-nuclear states over the lack of progress in disarmament. The operation of the Treaty is reviewed every five years, with the next meeting due in 2020. The preparatory work for this meeting is underway and can be viewed on the UNODA website here. The Comprehensive Nuclear Test Ban Treaty (CTBT) opened for signature in September 1996. Access Treaty text here. The CTBT prohibits nuclear weapon test explosions. The Conference on Disarmament (CD) in Geneva, began its substantive negotiations for the CTBT in 1994. After two years of negotiating, a draft treaty was presented to the CD. Read about how the Treaty was adopted here. The Treaty establishes a CTBT Organization (CTBTO), located in Vienna, to ensure the implementation of its provisions. The Treaty's verification regime includes the International Monitoring System (IMS) composed of seismological, radionuclide (16 laboratories), hydroacoustic and infrasound monitoring; consultation and clarification; on-site inspections; and confidence-building measures. When fully operational, the IMS will consist of 321 monitoring stations alongside the existing 16 radionuclide laboratories. The CTBT has not yet entered into force, since three of the 44 required states have yet to sign it and five to ratify it. The states that still need to sign it are the Democratic People's Republic of Korea (DPRK), India, and Pakistan. Five of the 44 Annex 2 States have signed but not ratified the CTBT; they are China, Egypt, Iran, Israel, and USA. An excellent description of the CTBT, its purpose and functions, can be found on the Nuclear Threat Initiative website here. See the status of the Treaty and the stationing of the international monitoring stations on the CTBT Organisation website here. Fissile Materials Cut Off Treaty (draft Treaty). In a A/RES/71/259 resolution adopted by the UN General Assembly on 11 January 2017, States called for the UN to “immediately begin negotiation of a treaty banning the production of fissile material for use in nuclear weapons or other nuclear explosive devices”. Read more about the progress of the negotiations and the Treaty drafting here. The establishment of Nuclear-Weapon-Free Zones (NWFZ) is a regional approach to strengthen global nuclear non-proliferation and disarmament norms and consolidate international efforts towards peace and security. Article VII of the Nuclear Non-Proliferation Treaty (NPT) states: “Nothing in this Treaty affects the right of any group of States to conclude regional treaties in order to assure the total absence of nuclear weapons in their respective territories“. (b) An international system of verification and control is established to guarantee compliance with the obligations deriving from that statute. New Zealand has now been nuclear free for over thirty years. 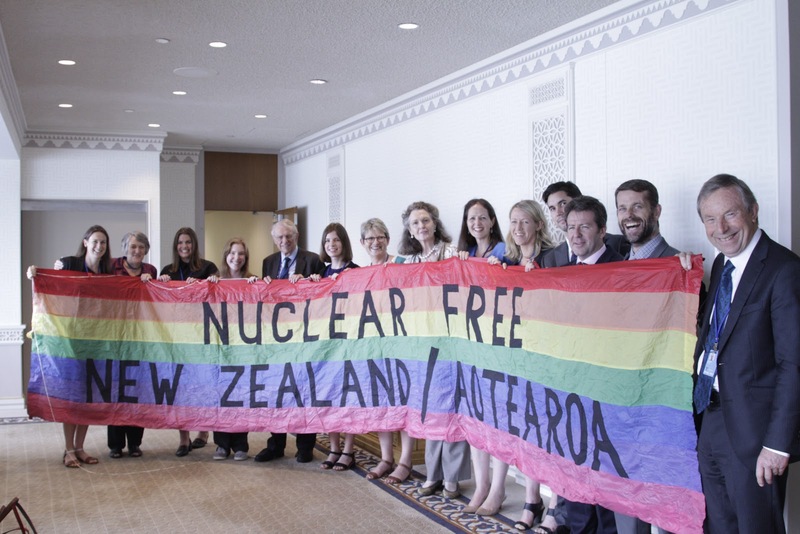 New Zealand’s nuclear-free law, adopted on 8 June 1987, was the result of a broad-based movement of ordinary New Zealanders, who worked tirelessly over decades to convince other New Zealanders, and their government, to oppose nuclear weapons. This citizens’ movement included faith-based organisations, sports groups, students, Māori/tangata whenua, women’s groups, business networks, doctors’ and lawyers’ associations and many others besides. By 1986, there were 350 active, local-area peace groups working on nuclear issues. In the process of becoming nuclear free, the nuclear free movement helped to redefine what it means to be a New Zealander. A new national identity was emerging—declaring New Zealand a nuclear free zone was also a declaration of national independence. New Zealand’s identity as an independent, principled nation still resonates today in venues such as the UN Security Council, on which New Zealand last served in 2015-16. Read more about New Zealand’s nuclear free history here. “New Zealand is a strong supporter of disarmament, particularly of weapons whose inhumane effects breach international humanitarian law and the associated laws of armed conflict covered by the Geneva and Hague Conventions. Read more about the New Zealand Government’s policy on nuclear weapons here. New Zealanders at the United Nations for the negotiations on the Treaty of the Prohibition of Nuclear Weapons. July 2017.